Based on the novella The Forged Coupon by Leo Tolstoy, L’Argent (Money) is the story of a counterfeit bill that would shape the lives of the various individuals it would encounter. Written for the screen and directed by Robert Bresson, the film is an exploration of money and the ills that it can bring into humanity all through a forged bill made as a prank that goes horribly wrong. Starring Christian Patey, Vincent Risterucci, Caroline Lang, Sylvie Van den Elsen, Didier Baussy, Beatrice Tabourin, and Marc Ernest Fourneau. L’Argent is a rapturous yet harrowing film from Robert Bresson. What happens when a simple prank over a forged bill would lead to trouble and affect the life of a truck driver and a photo shop’s assistant? That is pretty much the plot of the film as it play into a few individuals whose lives are drastically changed all because a couple of kids created a forged bill in the hopes for one of them to pay someone back and not think about the consequences. Robert Bresson’s screenplay begins with a young student named Norbert (Marc Ernest Fourneau) asking his parents for an advance of his allowance as he owes money to another student. His parents politely refuse as he turns to a classmate who had created a counterfeit 500 franc that they used to buy a picture frame at a photo shop and things suddenly go wrong. Notably when a truck driver named Yvon (Christian Patey) has unknowingly been given the forged bill where he would try to pay a waiter at a café as the waiter accuses him of being the counterfeiter. It would lead to a chain of events for Yvon whose life would go into ruin while a photo shop’s assistant in Lucien (Vincent Risterucci) would lie on court to protect his boss as he is later consumed with guilt as he goes into a world of crime. It all plays into the effects of this forged franc that would do where these two young men go into different directions as it all plays into the need for money either as a way to live for or to be used as some form of idealism. At the same time, there’s an element of dehumanization that occurs with the effect of this forged franc where both Yvon and Lucien deal with a sense of uncertainty as well as not know what they’re doing. Bresson’s direction is largely minimalistic in terms of the compositions he creates as there’s not much camera movement throughout the film in favor of creating precise compositions that play into this disconnect between man and self. 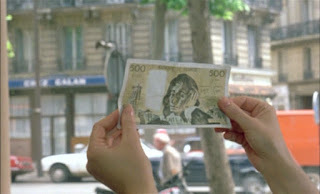 Shot partially in Paris, the film doesn’t dwell into famous locations in order to focus on a few locations in the city as well as how this forged bill would create chaos in a small location where the photo shop is. There’s a few wide shots in Bresson’s direction yet he would largely favor medium shots to get a look of the characters and their environment as well as the fact that he would position a camera at a door or a window where there’s so much that is happening through a glass window or a glass door. The compositions that Bresson creates would play into not just these elements of suspense but also in the drama as Bresson would have an actor in a frame to play up the sense of dehumanization. Most notably the sequence where Yvon is in prison as he would be put in solitary confinement as he refuses to read letters from his wife Elise (Caroline Lang) as it would add to this anguish and loss for Yvon who would descend into the darkest aspects of humanity. Yet, Bresson would also show elements of faith where a prisoner would pray for Yvon in one scene as well as a scene late in the film where Yvon stays at the home of an old woman (Sylvie Van den Elsen) who believes that people can be saved no matter what devious action or sin they committed. It would play into this sense of conflict of Yvon as it relates to his humanity but also the allure of something as toxic as money. 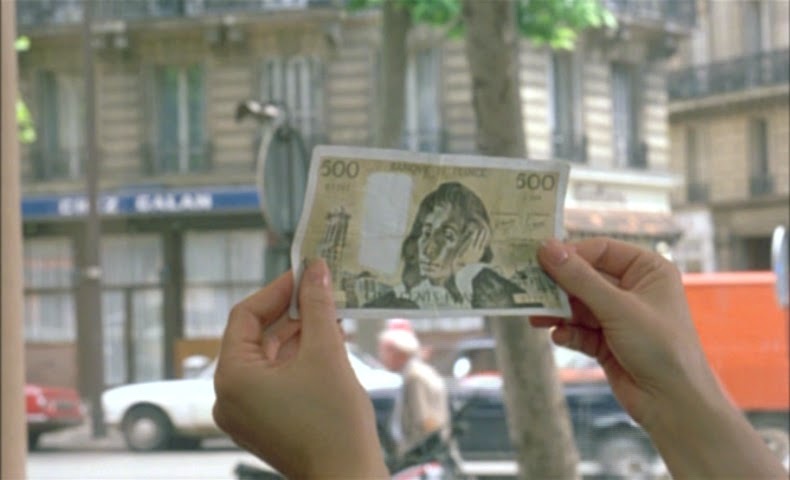 Even the film’s ending is Bresson at his most realistic as it shows not just the consequences of one’s action but also for the horrific motivation that is money whether it’s real or a forgery. Overall, Bresson crafts a mesmerizing yet unsettling film about the impact of a forged franc that would drastically change the lives of a few individuals. Cinematographers Pasqualino De Santis and Emmanuel Machuel do brilliant work with the film’s colorful cinematography with the usage of natural lighting for some of the daytime interior/exterior scenes including the usage of low-key lights for the scenes at night. Editor Jean-Francois Naudon does excellent work with the editing as it is largely straightforward to play into the drama and bit of suspense without anything stylized other than a few rhythmic cuts. Production designer Pierre Guffroy does fantastic work with the look of the photo shop as well as the prison that Yvon would go to and some of the places he would encounter. Costume designer Monique Dury does nice work with the costumes as it is largely casual with the exception of Norbert, Norbert’s parents, and the people who run the photo shop as they sort of wear posh-like clothing. Sound mixer Jacques Maumont does incredible work with the film’s sound in capturing the natural locations of what goes on in and out of a room as well as what happens in the streets where it is one of the film’s major highlights. The film’s wonderful cast include some notable small roles from Andre and Claude Cler as Norbert’s parents, Michel Briguet as the old woman’s father, Didier Baussy as the photo shop manager, Bruno Lapeyre as Norbert’s friend Martial who created the forged franc, Beatrice Tabourin as the photo shop clerk, and Caroline Lang as Yvon’s wife Elise who copes with not just his incarceration but also something much bigger that adds to Yvon’s descent. Marc Ernest Fourneau is terrific as Norbert as the young student who would set the chain of events to occur unaware of what he’s done as it’s all about trying to pay back some money he owes and creating a prank that went horribly wrong. Sylvie Van den Elsen is superb as the old lady whom Yvon meets late in the film as a woman who would take Yvon into her home as she sees how troubled he is but reminds him that he can redeem himself. Vincent Risterucci is excellent as Lucien as a photo shop assistant who would lie for his boss in order to get himself and his boss out of trouble only to go into a world of crime as a way to cope with his guilt. Finally, there’s Christian Patey in a brilliant performance as Yvon Targe as a truck driver whose encounter with a forged franc would cause a chain of events in his life to shatter from being accused of creating a forged franc to other crimes as he would descend into darkness as it is a chilling performance from Patey. The 2017 Region 1/Region A DVD/Blu-Ray from the Criterion Collection presents the film in a newly restored 4K digital transfer with Dolby Digital Mono (uncompressed in its Blu-Ray release) in French with English subtitles in the film’s original 1:66:1 aspect ratio. The special features include the film’s original theatrical trailer and two major featurettes. The first is a 31-minute press conference from the 1983 Cannes Film Festival in which Bresson and actors from the film talk answer questions to critics and journalists. The video shows Bresson being cagey in some of his answers where he would say things that he knows that can’t be explained as he also admits that he’s not a genius. He would also criticize certain things about cinema as he’s aware that his films aren’t commercial and he has no intentions in making them commercial. He also talks about his own views on humanity and many of the themes in the film as it is a compelling press conference that shows Bresson in his element with a couple of the actors getting a few words in as it’s really more about Bresson who really doesn’t care what the audience thinks of the film as it wasn’t well-received by the audience who booed the film in its premiere. The 51-minute video essay L’Argent, A to Z by film scholar James Quandt who narrates the essay. The video essay talks about the film the letters A to Z in 26 parts to explain the film’s meaning, its influence, and Bresson himself. Quandt talks about the many motifs that Bresson would put into the film but also the evolution of his trademarks as it would culminate with so much in his final film as would his view of the world which has him become more pessimistic in relation to some of the things that was happening in France at the time. Bresson’s influences are mentioned as it ranged from philosophers, artists, and literary figures with Dostoyevsky being the most notable yet it is Leo Tolstoy’s novella that would inspire him to create what would be his final film. It’s a fascinating video essay that explores the many attributes about the film and why it remains compelling more than 30 years since its release. The DVD/Blu-ray booklet include an essay by film critic Adrian Martin entitled The Weight of the World about the film and Bresson’s methods into the art of filmmaking. Martin talks about many of the film’s themes and how it relates to a lot of Bresson’s body of work in film. It also dwell into some of the spiritual aspects of the film in its exploration of redemption and temptation as it relates to the character of Yvon. Martin says that this film, of all of Bresson’s films, is his darkest and most vicious in terms of the fates of the protagonists as well as the situations that happen and its setting. It all play into the way Bresson sees things as he is aware of how cruel the world can be but also sees that there can be a sense of hope no matter how dark the world is. The interview entitled I’m Not Looking for a Description but for a Vision of Things in which Robert Bresson discusses the film with Michel Clement in 1983 that was later published in full for the magazine Positif in 1996. Bresson talks about some of his filmmaking methods and theories as well as his approach to storytelling as it relates to the film. Notably his approach to sound and sound design as a way to create an atmosphere for the world that the characters are in. He also discusses his literary influences and the ideas he would get for the film as well as a brief discussion about a film project that never came to fruition that was to revolve around the genesis of Earth. It’s a riveting interview that explores many of Bresson’s views on films and storytelling as well as reasons why never uses actors in order to get a sense of realism that he wanted. L’Argent is a magnificent film from Robert Bresson. Featuring a great cast, eerie visuals, a low-key yet simple presentation, and evocative takes on themes of inhumanity and greed. It’s a film that explores what a simple forged bill can do in creating chaos and drastically change the lives of a few individuals to the point that they lose aspects of themselves as well as raise questions about redemption. In the end, L’Argent is an outstanding film from Robert Bresson. I'm familiar with the name, but sadly, I haven't seen any of Bressn's work. I should change that. @Wendell-I'd start with Pickpocket. That's pretty much his most essential film as it's the one film a lot of filmmakers go to. I'd also check out films like Au Hasard Balthazar, Mouchette (my favorite of his so far), and A Man Escaped. He's an unusual filmmaker for the fact that he doesn't have a real visual style and never uses professional actors during his prime but he is a compelling filmmaker. L'Argent is one of his most essential films as it bear a lot of his visual and thematical hallmarks but it's also very dark. It was also his last film as he never made anything after that as his attempts to great a film on the genesis of earth never came to fruition. That's often the case into why he never made a lot of films was due to money as many of them aren't commercial. @Getter-If you haven't seen anything by Robert Bresson, I'd suggest you'd start with Pickpocket.